“Aw, hell!” I heard Star shout from upstairs. The the sound of tumbling objects onto the ground made me aware that something must have gone awry in his mission to clear out the rooms. The loud crash of a shelf falling confirmed it. I hurried up the stairs and swung open the door to Star’s room. The scene in front of me was one of pure chaos. All along the floor were dozens of old, musty books. The bed, which used to face the door, was now turned on it’s side, by some trick of Star backfiring on him no doubt. The boy in question was half buried under the piles of books and half stuck under the fallen bookshelf. “Well, hello, Vanessa. Sorry to bother you, but would you mind being a dear and lifting the shelf just a few inches?” Star said, his face covered by a cheery grin. I closed my eyes and pinched the bridge of my nose, trying my best to stay calm. “Star, you realize that your sister left us here so that we could clean the house, not turn it into even more of a pigsty,” I sighed. I had just finished clearing the kitchen, the foyer, and the living room downstairs. Now, my workload had almost doubled thanks to Star’s clumsy stunt. “Okay, I understand. However, do you understand that you getting mad at me only shortens the amount of time we have?” He said, raising an eyebrow. He was right, as much as I wanted to leave him in his mess as punishment. I used every ounce of my strength (which wasn’t very much) to lift the shelf off of him for a few seconds. Star slid out of the gap and hopped up, pushing dozens of books aside. I let the shelf fall back down. The two of us began picking up books, organizing them on Star’s bed by genre. The vast majority of them were history books, which pleasantly surprised me. The normally aloof and go-with-the-flow Star never seemed like the kind of person to be into learning about the past. “Ah, I forgot about this!” Star exclaimed. I looked over from my stack of books to him. He held a dirty clay jar around the size of my forearm. “Mind sharing what you have in your hands, Star? It doesn’t exactly seem like you to keep souvenirs,” I said. “It’s a memory jar I made with my father when he was around. I haven’t opened this in years!” Star replied. He popped open the top of jar, sending a cloud of dust directly into his face. After having a coughing fit and telling me to stop laughing, Star began to take old pieces of paper out of the jar. I walked over to him and peered over his shoulder. It was an old photograph, bug eaten at the edges. In it, I saw a very young Star, no more than eight years of age, his light hair messy and unkempt, no doubt due to the hand of the incredibly tall man that was placed on the boy’s head. The man was large in stature, with the same gray hair as Star, with a hint of stubble at his chin. His eyes peered into me from the photograph. At first they seemed cold and calculating, but then I noticed the smile on the man’s lips. It was one of happiness, a toothy grin of love I couldn’t even fathom. When I combined it with his eyes, his eyes spoke a different message to me. They were warm and caring, as if they were opening out to me, welcoming me to join him and his son. “I remember this. This was the first time my dad took me outside the walls of this city. We went to a place with massive hills and had lunch together,” Star said. Immediately, I detected sadness in his voice. As the boy started taking more pictures and some letters out of the jar, I noticed his head drooping. A silver sparkle flashed across my vision as a tear fell from Star’s face. “Well, uh, I finished organizing the books and putting the shelf back up. I’ll go look around the house for other things to do,” I stated awkwardly. Star could only give me a quick nod as he continued to read letters his father had wrote to him from the army base. I quickly stepped out of the room and slowly closed the door behind me. Through the crack in the door, I could see Star, now sitting on his bed, letting streams of tears fall freely towards the floor. He didn’t make a sound, other than the occasional sniff. 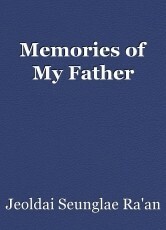 I turned away from the door and reflected on my own situation with my father. It was. . . fine. There wasn’t anything too bad, but nothing particularly good, either. He was always away on business trips, so I saw him about a few times a month. I had thought that my relationship with my dad was a good one, but as I looked at Star, I realized that wasn’t the case. If my dad were to pass on, I would inherit the company, and that would be it. I knew I’d miss him, but I figured I’d be over it in a month.Star’s father, however, was different. From a photograph alone, I could tell that the man had nothing but love in his heart for his son. A love that resonated so powerfully that a bunch of mere memories could drive the son to tears. That jar of memories was proof that I could never fully understand how much love a parent had for their child. I simply had never received it. © Copyright 2019 Jeoldai Seunglae Ra'an. All rights reserved.